SWF Banner is a software for creating custom flash banners for websites. It is provided with various features designed for this purpose. Creating flash banners: SWF Banner offers the ability to easily create flash banners for websites. To perform such action, the user does not have to enter a single code line as all these technical parts are already ensured by the application. 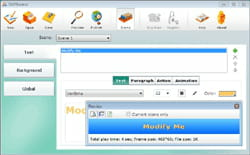 Settings: it is possible to apply various custom settings to the created item so as to obtain an original result. It is allowed to edit backgrounds, change font size and colors, insert image and define its position on the screen and over more. Templates: SWF Banner consists of 20 predefined templates. The user can choose one of them when getting started. Of course, each one is fully customizable so as to fit his needs and preferences. Supported file formats: what makes this application stand out from all others is probably the fact that it supports a wide range of media formats to be imported to the creation. It can deal with JPEG, BMP, GIF and PNG. It also supports MP3. SWF Banner is compatible with all Windows and Mac OS X platforms. There is no particular comment. Latest update on April 1, 2015 at 04:08 AM.